For a brief period during April Fool's Day 2013, a wormhole opened between the universes of Godville and Star Trek. A few tribbles slipped through, and they've been making a home in loot bags, Mystery Boxes, and the like ever since. The anatomy of one of these creatures. Tribbles are small, furry creatures that reproduce at an incredible rate; they are born pregnant. Although adorable, their ability to multiply (and the amount of food they eat) makes them indirectly very dangerous. Tribbles will multiply to fill up more and more slots of a loot bag, preventing a hero from carrying more valuable treasures. Because few traders want tribbles, the hero will have difficulty selling them, ending up stuck with an increasingly full loot bag for some time. Eventually (usually after a day or two?) 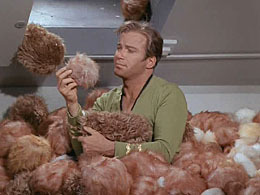 the hero will find somewhere to sell the tribbles, but it is rarely worth the loss of inventory space in the meantime. Tribbles eat an item in the hero's inventory when multiplying, replacing it. There exists an alternate form of the tribble, named the hungry tribble. These behave much in the same way as regular tribbles and are occasionally received as a reward for defeating a boss monster in a dungeon. 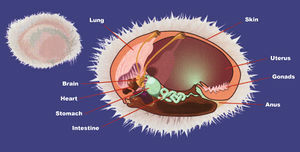 There are two key differences between the regular tribble and their hungry counterparts. While one or more hungry tribbles reside in the heroes inventory, there is around a 33% chance during the defeat of a monster that the hero will remark in his diary that the hungry tribble(s) have devoured the monster. The hungry tribbles consume the usual rewards of loot and gold. It is unknown at this point whether the tribbles also consume the experience from a defeated foe. Once the hungry tribbles reach critical mass, which is around 75% of a hero's inventory space, they will promptly evacuate the heroes backpack and flee to see the world, presumably on a family vacation. Upon doing so, hungry tribbles typically leave large sums of money, around 100 - 250 gold per tribble, presumably as overdue rent. Whenever a monster is consumed, the tribbles multiply, producing another hungry tribble. Given this, while ordinary tribbles are almost always a burden on the hero, the gold received from carrying hungry tribbles may right well make it a worthwhile effort. Of course, the fact that these hungry tribbles also consume items and gold from defeated heroes leaves the answer of this debate more open to individual decision. 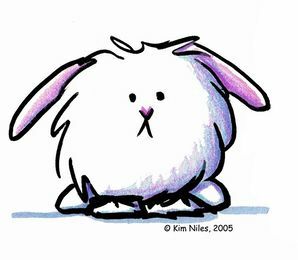 Tribbles are found in artifacts like the Box with a question mark, Deus ex machina, Mystery box, Wonderbox, etc., which generally cost 50% godpower and can make a "good or bad" thing happen to the hero. Hungry tribbles can be sometimes found in the inventory of a boss-monster, and may be acquired upon defeating it. Tribbles seem to multiply between the end of selling loot and the beginning of the "staring at counter" phases. Peeked into my loot bag just in time to see a furry ball making purr and divided into two pieces. Found even more furry tribbles in my inventory. Where did they come from? Notes from the battlefield: Beepocles is defeated. El Cannabis got 5058 gold coins. El Cannabis put a tribble, a tribble, a tribble, a tribble, a tribble, a tribble, a tribble, a tribble, a tribble, a tribble, a tribble, a tribble, a tribble, a tribble, a tribble, a tribble, a tribble, a tribble, a tribble and Beepocles' dog tag into his bag. A soft tribble went to my hand. It wheezed and purred and made me feel better and healthier. Used my loot bag as a pillow while resting. It was unusually soft... I guess there is something good in these tribbles. This page was last edited on 4 April 2019, at 14:53.